Salty prosciutto covered creamy melted fresh mozzarella and balanced by sweet fig preserves and peppery arugula all wrapped in a crusty ciabatta bun and grilled to perfection. The idea for this sandwich has been floating around in my head for a few weeks now as I worked on the recipe and this weekend I finally nailed the it and got the chance to make it. 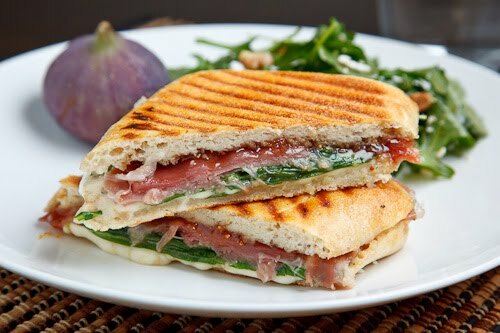 The basic idea behind this sandwich was to combine sweet fig preserves with salty prosciutto in a grilled cheese sandwich that is cooked panini style in a grill press. Sweet things like jams and preserves work surprisingly well in grilled cheese sandwiches and when combined with something like prosciutto you definitely have a winning combination. For the cheese I wanted to go with something that does not have a strong flavour so that it does not drown out the flavours of the fig preserves and prosciutto and mozzarella was the perfect choice. At this point the sandwich was already sounding really good but I was sure that some peppery arugula, lightly tossed in a balsamic vinaigrette would make the sandwich even better! For the bread I went with a ciabatta bun that worked particularly well when pressed panini style. Ooh, that sandwich sounds amazing. Can't go wrong with fig and prosciutto. A perfect pairing! I have no doubt that this flavor combination is a winner. When figs ripen on my tree, I like to broil them briefly with a bit of blue cheese, wrapped in proscuitto. I'm telling you man…..you gotta! Kev, looks good and at least the size appears edible. ok I know you don't want to post but just a note from me to you. Ok no prob. ciao. fleur. Very scrumptious! A divine combo. This is a sandwich after my own heart. I love figs and prosciutto together. Pressed between two pieces of quality toast and cheese… perfection. This reminds me of a stepped up monte cristo! Loving it. Anything with figs and cheese makes me unendingly happy. YUM….this sounds amazing! I love figs and proscuitto together!